Another appearance of Werewolf By Night? While I’m missing the Marvel US reprints I did manage to pick up the next story from IDW’s own reprints, which contains new coloring. It also has the last strip of “Doctor Who & The Star Beast” because they left the comics completely as they were in the magazine, complete with chapter breaks. I like the way Marvel did it better. 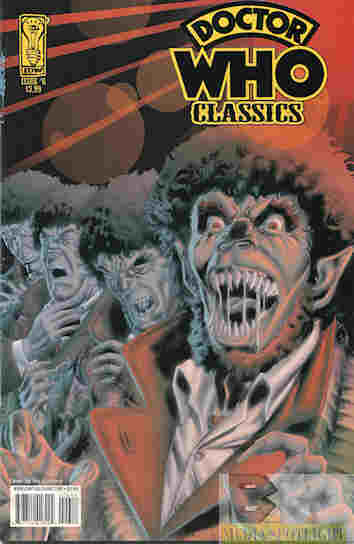 The Werelox, a race of werewolves, is on the attack in the New Earth system. (In case you thought that was a New Who concept.) In attempting to get Sharon back to Earth of course the TARDIS goes off-course and ends up on a cargo ship headed to one of the colonies. The ship is attacked by the Werelox and the Doctor ends up infected. He uses the TARDIS to get away long enough to come up with an antidote, which he distributes to the New Earth scientists, then questions one of the Werelox about their masters. Said masters are the Daleks! What they got right: This battle against werewolves is more interesting than “Tooth & Claw”, that one New Who episode I still maintain is worse than “Love & Monsters” because it makes the Doctor a jerk and Rose somehow even worse than usual, and that shouldn’t even be possible. “Love & Monsters” was at least passable if subpar as a Doctor lite episode until that dumb ending. Anyway, I like that the Doctor actually came up with a cure for the Werelox venom. And this time K-9 can actually hurt the bad guys! This is also where Sharon gets the jumpsuit she’ll wear for the rest of her run. What they got wrong: The weird stereotyping. In case you thought it was just us doing that to the Brits, here they’re doing it to us. One colony is based on the Old West, fine. But the colony is called Davy Crockett, the dome they hide in The Alamo (perhaps foreshadowing that was going to end badly?) and it all seemed more like a Westworld theme park than legit. Also the cargo pilot talks in CB trucker language even when he isn’t on the CB, although his co-pilot doesn’t. Recommendation: A good start. While I think the Marvel layout works better as a regular comic and the 80s coloring fit the lineart better than the modern techniques IDW used it’s not a bad alternative to the Marvel run if you can find it. Pendar briefly considered killing Kroton with a large boulder, but found that he could not, as it would make him no better than the Cybermen. Reunited with Marilka, the three began discussing the events, where Pendar realised that Kroton had retained some of his human emotions. Kroton was highly doubtful of his place in the universe — if were to return to his life as a Cyberman, he would be deactivated, but as a Cyberman he would not be trusted by any species but his own. Penar disagreed, saying that once the resistance had won against the oppressive Cybermen, that Kroton would have a place among his people. The three decided to steal a shuttle as it was an unexpected tactic. They were attacked by Cybermen on the base they chose but were able to get to a small ship. The ship they used to escape was low on fuel, meaning that the three had to stop off in the centre of the wilderness. Kroton’s battery packs were running low, and knowing that he had no way to recharge them and that the shuttle would only key the other Cybermen into his friends’ position, he chose to use the remaining fuel to shoot out of the planet’s atmosphere, saving Marilka and Pendar but leaving him lifeless, floating in space for years. He does in later stories and I hope I get to read them. Kroton is an interesting idea and character I want to see more of. Posted by ShadowWing Tronix on August 22, 2018 in Television Spotlight, Yesterday's Comics and tagged Doctor Who, K-9, Sharon Davies, The Fourth Doctor. I didn’t know that IDW reprinted these comic stories. How was the coloring in the IDW comic different from that of the Marvel 80s comic of Doctor Who? Compare the covers to the covers of the Marvel reprints and you’ll see what I mean. Yes, I see what you mean. The coloring of the Marvel comics is much better.